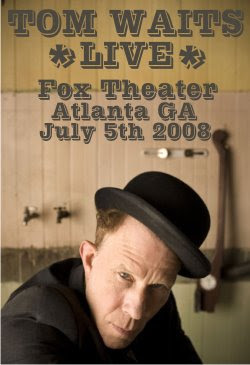 Here, as I promised, is part two of Tom Waits performance at Atlanta's Fox Theater on July 5th. He sounds pretty damn good for an old man.... I guess he's finally caught up to his voice. November 20th 2009: THESE SONGS HAVE BEEN RE-POSTED HERE. Get part one of the show here. Wow, thanks for this! I'm a Waits novice and I thought... why not? Hey Daniel - thanks for taking the time to say thanks. Glad I could help you get into Mr Waits... and there's a lot to get into it. Have fun. Awesome! I was at this show. Thanks for posting it. Hey, is there any where i can still get this? The orginal link is 404 now. Busker - send me an email, my contact is at the top right.